Needless to say, you keep your hair clean by washing it on a regular basis to keep it looking and smelling great. Daily life being filled with dust, dirt, sweat and any number of hair products used to shape or style your hair can, and most often does, lead to a lack luster appearance in the hair and a shorter lifespan. Hair extensions are no exception. To prevent this, shampooing the hair extensions once they have become dirty can be done with little to no fuss. Before washing your hair extensions, you must ensure that there are no knots and tangles present in the hair simply by using a soft brush. Do not tug on the hair as you can rip out the hair extensions. Then, gradually wet your hair, brush it again and then apply mild shampoo. You should wash in a downward motion to avoid creating additional knots and tangles. Just pat dry the hair instead of rubbing it and then brush only when it is completely dry. Always use a soft bristle brush with your hair and use gentle motions only. You should start at the ends while working your way up into the top of the head. Remember to use downward motions only since upward motions can create tangles. And do brush your hair at least 3 times a day, more when you live in a windy area. ​As much as possible, keep heat from blow dryers and curling irons away from your natural human hair extensions. This way, you can extend their life and, keep them in terrific condition much longer. Although human hair extensions can be curled, colored and treated, you should let a qualified hair stylist do it for you. At the very least, you will not be exposing yourself to botched DIY hair jobs. Old wives' tales aside, we also advise not going to sleep with your hair wet because this will damage your hair extensions. Instead, make sure that it has been air-dried and then wrapped in a hair towel or gently tied in a loose ponytail to prevent tangles and knots. If your hair is suitable to be styled in a ponytail, then do so when you want to exercise. In all these activities, you must use only the recommended hair products. Ask you hair stylist about them as well as inquire about more affordable alternatives. Truly, with proper care, you can get more value from your hair extensions. The same is true with the use of heating tools like curling irons, flat irons, blow dryers and hot rollers. You can subject your 100% human hair extensions to the heat from these styling tools, in the same way as you do your natural hair. Again, you must be gentler with these styling tools on your hair extensions as tugging too much can cause them to separate from the natural hair. Plus, there is also the matter of matted hair when you apply too much heat, pressure and stress on the hair extensions. Synthetic hair must not be exposed to heat in any level from the above mentioned styling tools. Again, the materials in synthetic hair are not designed for heat and, hence, will warp, melt and burn even from the relatively low heat of the blow dyer. This is yet another reason to opt for real human hair. There are hair extensions that are made from a combination of human and synthetic hair. In this case, we suggest treating them as though they were made entirely from synthetic hair and not heat or style them as you would human hair. Our hair is a 100% human hair so this is not a problem and you can colour, curl, style and straighten just as you would normal hair. No matter the kind of hair extensions you are planning to purchase, one dictum remains unchanged - you must take very good care of your hair because it is your crowning glory. Once you have your hair extensions in place, your next concerns will be for its care and maintenance. 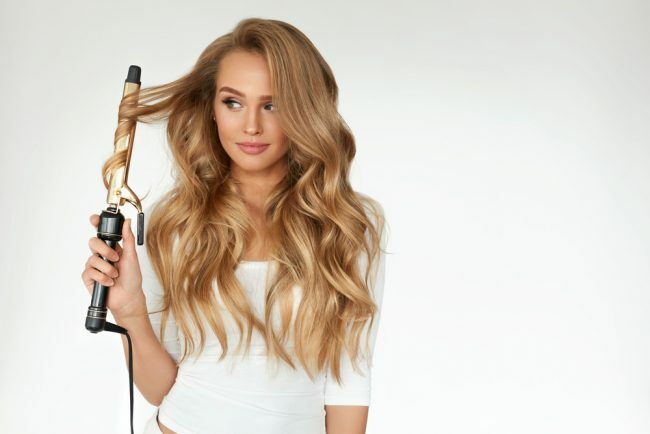 The very first of these concerns should be the application of heat to the hair extensions for the purpose of either curling or straightening them. Q.Can you apply heat to the hair extensions without causing damage to it? A.Well, the answer is a yes and a no depending on the types of hair extensions you have on your head. Q.Can Hair Extensions Be Chemically Treated or Coloured? Q. Can hair extensions be subjected to chemical treatments like cool highlights and, if yes, what are the risks? A. Well, the answer depends on the types of hair extensions attached to your natural hair - human or synthetic hair extensions. If you have human hair extensions, then the answer is a qualified yes, as you will find out later. If you have synthetic hair extensions, you should leave the chemical and mechanical experimentations to somebody with natural hair. Synthetic hair must never ever be chemically treated for hair colouring purposes. It is made from petrol products, which will adversely react with the chemicals in the hair dye as well as melt when exposed to heat. In other words, you are causing irreparable damage when you so much as try to dye your synthetic hair extensions. If you want more colour in your hair, stick to clip-on hair extensions instead. These are the best option when considering purchasing hair extensions because of the many processes necessary before it reaches your hair, not to mention the difficulty in securing virgin hair instead of manufacturing synthetic hair. In fact, synthetic hair is approximately 1/5 the cost of 100% human hair extensions. The benefits, fortunately, are well worth the price. 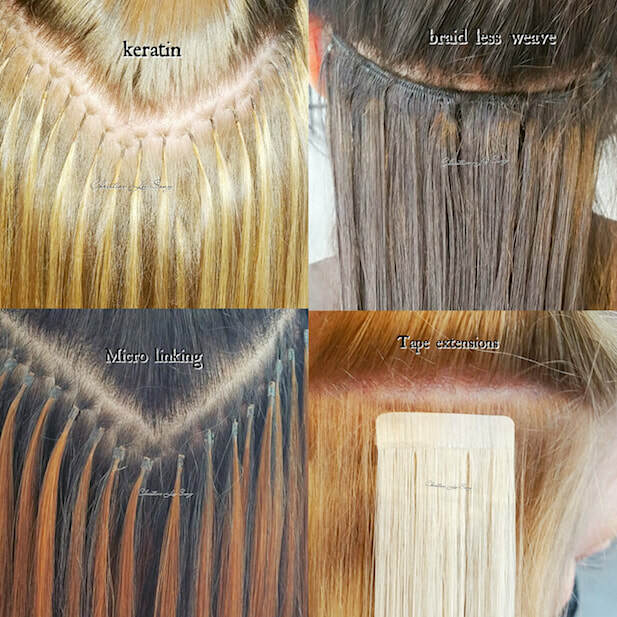 You can treat the human hair extensions as you would normal hair. You can colour and dye, curl and straighten, shampoo and condition as well as style it any way you want. Plus, these hair extensions usually last longer than their synthetic counterparts. Thus, you can apply the curling and flat iron as well as the blow dryer to your 100% human hair extensions. It can take the heat, so to speak, but only in moderation. Why? Simply because hair extensions have no source of moisture and, hence, will react to the heat coming from these styling tools more than natural hair would given the same amount of treatment. With excessive heat applied to the hair extensions, it will soon dry up and you are left with scraggly hair. So, before you experiment with your irons and blow dryers, do ask your hair stylist for advice. Better yet, let her do the job for you. Now, when it comes to synthetic hair extensions, you are well advised never to apply any kind of heat to it. Yes, not even the low heat of the blow dyer is good for your hair for many reasons. For another thing, the same petrol components will warp, melt and burn with the heat. You will then end up with the ugliest hair this side of the world. Think of plastic burning and you get the idea. Still, merits and demerits will vary from one type of hair extension to the next. So read and find out what these pros and cons are for hair extensions. Natural hair extensions come from real human hair, thus, these have the most natural look. However, the naturalness comes at a higher price, often 5 times more than the synthetic kinds. Most experts agree that Indian remy hair is of the highest quality while European hair comes a close second. The main advantage of natural hair extensions is that it can be treated in the same way as natural hair on the head, which means that it is easier to care for. It can be blow dried, curled and dyed many times over although it is not a good idea to overdo the chemical and mechanical treatments either. And then there are the synthetic hair extensions. These are more affordable than their natural counterparts in addition to being easier to find in many hair salons. Because of their affordability, individuals who only want hair extensions for special occasions find that these are more cost-efficient. However, the disadvantages can offset the merits of synthetic hair. These cannot be treated like natural hair - no heat, no colours - so much so that care is often difficult. Matting, tangling and knotting are also common with these hair extensions since the natural cuticles are non-existent.